The Angels started this series behind the 8-ball knowing they’d have to face both Greinke and Kershaw. 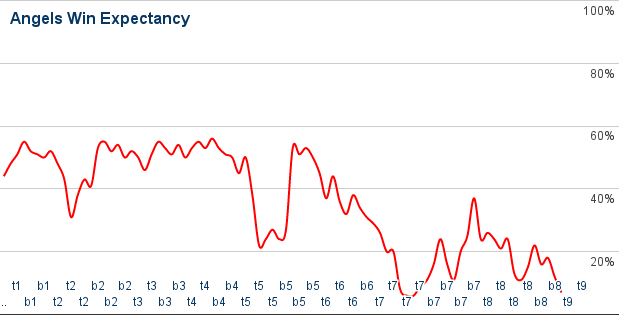 These first two games were pretty much write offs, which is why it was so frustrating to see the Angels blow a legitimate chance to actually beat Greinke. It wasn’t even necessarily that this was a choke job, though there certainly was some choking involved. It was a line drive just a little too high for Taylor Featherston to snare. It was two comebackers that glanced off Trevor Gott and turned into hits. It was an aborted double play because Featherston lost the ball on the transfer. It was a chopper off the plate that pierced the clouds it went so high. The offense actually made three different comeback attempts, showing a remarkable amount of fight and resilience that they’ve displayed precious little of up until now. But, yeah, there was some choking too, mostly from the bullpen. Four of the eight relievers pitched poorly and all four of those poor appearances proved extremely costly. Scioscia was just trying to pull every lever he could, but there’s only so much good that will do when many of those levers are already faulty. Alleged defensive stalwart Featherston had another rough day in the field, but he also had another nice day at the plate. Calhoun and Pujols stepped up as well to lead the offensive charge, but Mike Trout was the one who actually failed to deliver in big spots. Oh, and we also got a Matt Joyce hopeless strikeout cameo, just for old times’ sake. Scott Van Slyke had a “big” game even though his “big” hits were a double to the pitcher that glanced off Gott and slipped past the drawn in infield and a single from that sky high chopper off the plate. All the other Dodger big bats got shutdown, but it was guys like Justin Ruggiano and Joc Pederson that really gave the Angels problems. Nick Tropeano wasn’t great but he did his best to hold it together, unfortunately the bullpen undid a lot of that work. Zack Greinke wasn’t all that great either, by his standards, but it was good enough. And the reason Greinke’s start was good enough was because the Angels bullpen was a pile of garbage, which is saying something because the Dodgers bullpen is usually garbage but the Angels relievers made them look like nicely manicured compost. Just about everyone got a kick at the can for the Halos, but most of them ended up kicking themselves in the teeth. It was a group effort by the bullpen to blow this game, but it was Gott and his persistent unwillingness to miss bats that were the biggest failure of all.